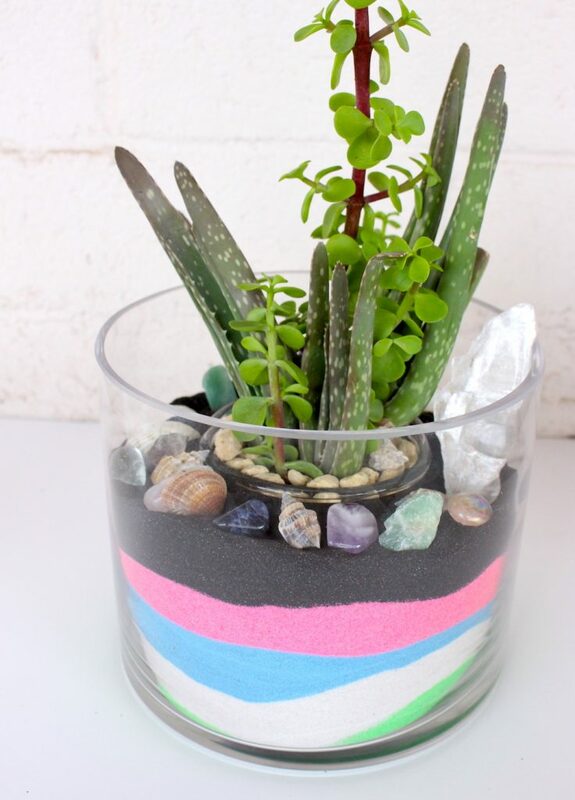 DIY Sand and Succulent Terrarium. Looking for creative ideas for decorating your home with succulents? DIY sand and succulent terrariums are an easy and fun home décor project. Learn how to create your very own with this helpful tutorial. Begin by planting your succulents in a small glass container with soil, horticultural charcoal and small pebbles. Position the small container into the center of the larger glass container. Then add the first color and layer of sand. Using a funnel, continue to add layers of sand, alternating the colors as you desire until reaching the top of the smaller container. To give some contrast to the sand, add talus to the top of the soil in the smaller container. The last step is to add some decorations on top of the sand, such as seashells, gems, stones or any other item you desire. To view the full tutorial, including more sand terrarium tips, supplies and design ideas, visit Kit Kraft. Kit Kraft has been serving creative people since 1946, with a large variety of art, craft and hobby supplies. This tutorial was created by Nicole Austin, a mixed media artist and instructor.